What Next? Generation North West is an open group for anyone engaged or interested in arts and culture in anyway, in their early to mid career, voluntary, paid, freelance or part of a larger organisational team. What Next? 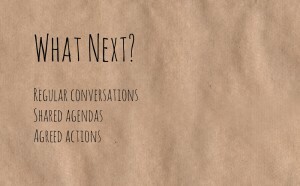 Gen is part of a national conversation called What Next? and the aim of the group is to come together and start a conversation about the value and impact of arts and culture in the UK and figure out ways of supporting theatre-makers, movers, audiences, participants and the public at large to talk about the value of arts. Our next meeting is on 11th September, 7pm – 8.30pm at Contact, Manchester and Fiona Gasper from the What Next? North West chapter will be coming along to talk with us. Please feel free to invite friends or colleagues – the bigger the group, the more impact we’ll have and it’s a brilliant opportunity to meet people who live and work in the North West! Teas and coffees will kindly be provided by Contact. Please email meathsarah@gmail.com if you have any questions and to confirm your attendance.